Around 700 people were killed in the city at the centre of the recent wave of violence in Nigeria, according to a senior regional military official. Col Ben Ahanotu, head of security in Maiduguri, said that mass burials had begun there. An earlier tally of victims of the unrest, in which police battled Islamists, put the figure at 400. Life in the affected areas is now beginning to return to normal with banks and markets reopening. Col Ahanotu said the compound of the Islamist sect behind the violence was being used as one of the burial sites because bodies were decomposing in the heat. He told the Associated Press news agency that officials gathering bodies had found "almost 700". The compound used by the Boko Haram sect was destroyed by government troops and is now smouldering rubble. 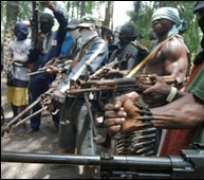 More members of the sect have been arrested in house-to-house searches across northern Nigeria and the military said most would be prosecuted. Maiduguri is the capital of Borno state but the fighting spread to cities across the north of the country and the total death toll is unknown. A military spokesman said two of those killed were soldiers and 13 were police officers. The number of injured, meanwhile, is still being counted. The Red Cross had earlier said about 3,500 people fled the fighting. The violence ended on Thursday when the sect's leader, Mohamed Yusuf, was killed by police. The controversy surrounding his death continues. The police say he was killed in a shoot-out while he was being detained. But Col Ahanotu says he captured him and handed him over alive.